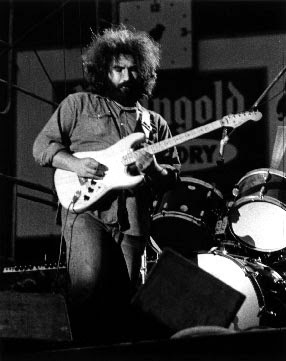 For today’s Tools of the Trade feature the rock room will focus on one of Jerry Garcia’s most beloved guitars. Garcia, well known for his custom instruments and his penchant for changing guitars until satisfied, was always involved in a constant search for the sound. Garcia’s ‘Alligator’ was donned during what could be the Grateful Dead’s most revolutionary and improvisational era. While at first making only sporadic appearances, the guitar moved into full time rotation in the Fall of 1971 and stayed on the stage through August of 1973 when it was unseated by the newly custom made ‘Wolf’. What is famously known as the ‘Alligator’ or also the ‘Nash’ Strat, is Garcia’s 1957 Fender Stratocaster, a present from Graham Nash reciprocating for all of the wonderful musical work Garcia had done for him as well as musical cohort David Crosby. 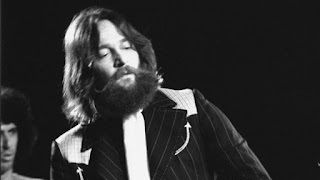 See Jerry’s soaring pedal steel work on Nash’s ‘I Used to Be a King’ and his slick six stringing on Crosby’s ‘Cowboy Movie’ for two prime examples of Garcia's melodic additions. The instrument was purchased by Nash while on tour in the States in 1970 at a second hand shop for around $250.00. Nash is on record as saying he was in Phoenix, AZ. The guitar was already the recipient of some modifications, as the 1957 swamp-ash body was fitted with a 1963 Fender maple neck. Garcia obviously loved the gift, because by the Fall of 1971 it had become his guitar of choice. Garcia picked and trilled through the sonic spectrum of the instrument for two massively expressive years, contributing all time psychedelic guitar to some of the Dead’s most beloved performances. The guitar was adept at speaking in sharp biting Fender through a Twin tone, eliciting an aural quicksilver. 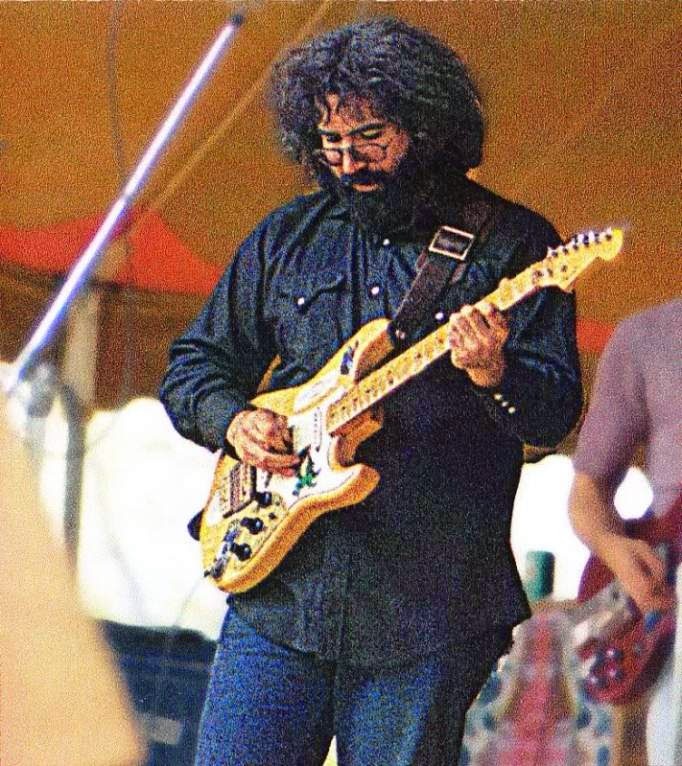 Alternately, the mountain air clean tone of the guitar could twang like a back porch banjo and allow Garcia’s personal touch to pop spring tight harmonics from the neck. The diversity of tone and dexterity of touch combo made the 'Alligator' an instrument to be feared. The guitar became and is the sound of Europe 1972’. For many discerning listeners, it is the quintessential sound of Garcia; but, like flavors of melting ice cream, everyone has their personal favorite. After Garcia took possession of the guitar it underwent a series of changes, both cosmetic and internal. Grateful Dead colleagues and personal sound masters at Alembic, the company responsible for many modifications to the Dead’s gear (Phil Lesh’s Mission Control Bass) referred to ‘Alligator’ as a ‘Frankenstein guitar' due to its numerous mods, scars and graffiti.The clandestine upgrades undertaken on the guitar are many and not all are officially documented. The major changes of note are new knobs, new brass hardware, including a new bridge and brass shield where the white pick guard had been cracked. It is also said in various places that the guitar was outfitted with a specialized Alembic StratoBlaster onboard preamp. The three guitar pickups are stock Fender with no major fiddling done to them. It is well known to Garcia aficionados that he often switched out his pickups to keep them fresh and incandescent. With the plethora of sounds available to Garcia at this point in the Dead’s career, it’s no wonder the concerts of 1972 often reached stratospheric levels. The sonic pallet finally had caught up with Garcia’s monumental and peaking abilities. 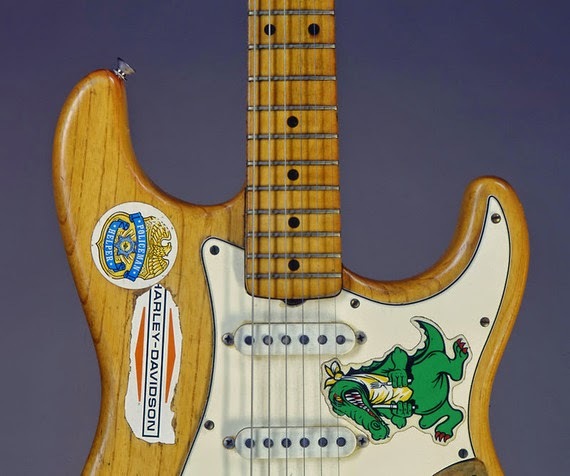 The guitar received its moniker and is famously identified by the hungry ‘Alligator’ sticker that appears between the middle and neck pickups. Eating utensils in each respective green hand the sneering red eyed reptile is ready to devour a musical feast. Other stickers would come and go, but to this day still a torn and frayed ‘Harley Davidson’ and ‘Policeman Helper’ badge remain. The 'Alligator' guitar is still owned by the Garcia estate and still comes out to stretch its strings and play once in a while. The special instrument is now identified with an era when anything was possible for the Grateful Dead. They were playing with a ferocity and experimental sense of purpose that would arguably never be witnessed again. The 'Nash-Alligator Strat' was the fortunate instrument to propagate this formidable wave of inspiration.